So – I couldn’t find a way to resist this one – I’m obsessed with the BBC mysteries that air on PBS weekly, and have been taken in by the improbably Australian production of the Miss Fisher’s Murder Mysteries, the heroine is a straight-forward modern woman, rather clever but mostly lucky, with a fun setting and clever mix of historical influences and murder. So, I had hopes. Traveling to her brother-in-law’s ‘fat farm’, Lola and Berta have been hired to find a diary belonging to the daughter of her mother’s friend. Friend’s daughter Grace and her diary disappear shortly after their arrival, and then the bodies start to drop….. Characters stand out in this story: Lola with her ‘way’ of approaching life and it’s pleasures, her attempts to maintain a ‘certain standard’ in all things while still enjoying the times she indulges her sweet tooth. Berta, a no-nonsense and rather pragmatic woman with a logical way of thinking, a belief in Lola and her wish to do well, and providing an insight and perspective that the life Lola has led do not provide. When you add in Ralph the detective with his obvious feelings for Lola despite her driving him around the bend with her unorthodox approach, there are plenty of moments to love, and the story moves forward quickly. Engaging, unique and clever, I’ll be sure to read more of this series. 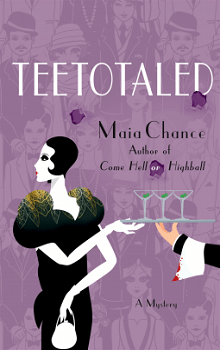 In Maia Chance’s follow-up to her acclaimed Prohibition-era caper Come Hell or Highball, Lola Woodby is hired to find a diary, but soon the diary owner’s future mother-in-law is murdered. But barely a day in, Grace and her diary escape from the facility—and Grace’s future mother-in-law is found murdered on the premises. Lola and Berta are promptly fired. But before they can climb into Lola’s red and white Duesenberg Model A and whiz off the property, they find themselves with a new client and a new charge: to solve the murder of Grace’s future mother-in-law. The afternoon Sophronia Whiddle offered us the diary job, it was so hot, you could’ve sizzled bacon on the sidewalk. Which wasn’t a half-bad idea, come to think of it, except that I was out of funds for bacon. I’d been living on shredded wheat for days. All right, hours. My detecting partner, Berta Lundgren, and I were reading at the kitchen table in our poky little Washington Square apartment, waiting for the telephone to ring. Stagnant city air puffed in from the window. My Pomeranian, Cedric, panted in front of an electric fan. I yawned, and turned a page of the latest issue of Thrilling Romance. “Mrs. Woodby, would it be remiss of me to suggest that you spend your leisure hours reading edifying publications?” Berta asked in her stern Swedish accent. She held up her book. Mexico City Mayhem, by Frank B. Jones, Jr. The cover depicted a man in a fedora wrestling a sinister-looking fellow in some sort of Aztec temple. “That is edifying?” I asked. I gave Thrilling Romance a shake and resumed reading. Berta sent me a dirty look, patted her gray bun, and went back to her book. Is this what had become of the newly hatched Discreet Retrieval Agency? Two sweaty, bickering ladies waiting for ginky fellows to telephone? A knock at the apartment door launched me to the little entry foyer. Berta wasn’t far behind. Cedric made a halfhearted yap but stayed in the kitchen. He had been lackluster lately because he was on strict kibble rations. If he didn’t slim down in time for his photograph session in two weeks, the people at Spratt’s Puppy Biscuits weren’t going to use him in their advertising campaign. Cedric’s career would be over before it began. “Oh, they’ll understand,” I said, and opened the door. At first it seemed that no one was there. Just the stairwell, stinking of mildew and fried onions. Then I noticed the snub-nosed five-year-old boy. “Okay, sure, thanks something fierce, Mrs. Woodby!” Sam pocketed the nickel and scampered up the stairs in the direction of his family’s third-floor apartment. I shut the door and turned. Berta blocked the foyer doorway. “This simply will not do,” she said. We drifted back to the kitchen. In the past month, our fledgling agency had solved a total of five cases: disappearing milk bottles, nicked newspapers, two lost cats (including Puffy), and a spying endeavor involving the teenaged Martin Ulsky and his two-timing ways. The only payment we’d accepted was a set of Mrs. Bent’s hand-knitted egg cozies. Which were pretty cute. “The rent will be due again,” Berta said. Another knock sounded on the door. Cedric didn’t bother yapping this time. Berta and I locked desperate eyes. Once I’d stuffed my feet into a pair of T-straps, Berta opened the door. “Mrs. Lundgren used to be my cook,” I said. “How pleasant to see you, Mrs. Whiddle.” Seeing Sophronia Whiddle was about as pleasant as an ingrown toenail. Sophronia was not only a New York grande dame, but my own mother’s bosom friend, too. Mother, by the way, had no inkling that I’d gone into the gumshoe trade. I was supposed to be mourning my recently popped-off husband, Alfie. But since Alfie had left me high and dry, I was no longer a pampered, thirty-one-year-old Society Matron. I was a working lady. At least, I was trying to be a working lady. Sophronia did a once-over of my wrinkly, last-season dress, my mussed dark brown bob, and my wide mouth and blue eyes that I hadn’t spruced up with lipstick or mascara. I was conserving the last of my department store cosmetics.